Google TV (s GOOG) picked up some steam at this year’s CES, with Vizio, Sony and LG announcing new devices for the smart TV platform. But as Google is paving the way to take the platform mainstream, a new, potentially powerful competitor is starting to emerge. No, it’s not Apple’s(s AAPL) long-rumored TV set but Google’s own open-source Android operating system, which is used by CE manufacturers and pay-TV operators alike to introduce new devices and services that come with Android apps but without Google’s blessing. First, the good news for Google TV: Vizio introduced two TV sets as well as a Roku-like set-top box and a Blu-ray player, all of which will feature Google TV with the company’s own UI design. Sony (s SNE) added another Blu-ray player and a media player device to its existing Google TV lineup, and LG introduced two 3-D TV sets that combine Google TV with the company’s own smart TV UI. Google also announced that Samsung will introduce additional devices later this year and boasted partnerships with chip makers Marvell and MediaTek. 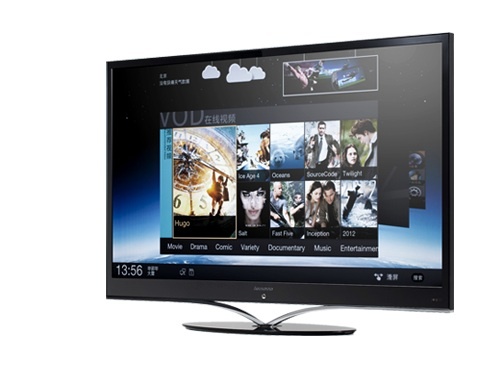 Lenovo's first TV set runs Android but not Google TV. However, there were also signs that some CE makers may like Android but not necessarily Google’s take on the future of TV. Chinese TV maker Lenovo took its first ambitious step toward the living room with the introduction of the world’s first TV based on Android 4.0, also known as Ice Cream Sandwich. The feature-rich Lenovo K91 will initially be available in China only, and it won’t have access to the Android Market or any of the TV apps developed by Google. Owners of the device will instead be able to download apps straight from Lenovo’s own Android app store, which the company is operating in China, on other Android devices as well. Lenovo wasn’t the only one to stray from the Google TV bandwagon: Despite being an official Google TV partner, Samsung introduced a webcam that is fully loaded with a highly customized version of Android to bring Skype video chat and other apps to legacy TV sets. It’s a curious move but one that could be copied by other CE makers for add-on gadgets and even full-blown TV sets. Going through the process of becoming official Google TV partners and getting their devices Android certified means that manufacturers have to fulfill a number of requirements. Manufacturers may simply decide that it’s cheaper to work with a customized, slimmed-down version of Android and do without access to Google’s ecosystem. And if the Kindle Fire teaches us anything, it’s that a cheap but highly customized Android platform can compete just fine with Google’s official versions. I talked about this issue with Google TV VP of product management Mario Queiroz this week, who told me he doesn’t see any imminent Kindle Fire–like threat for Google TV. “I’m not concerned about fragmentation,” he said, adding that the Google TV stack isn’t just about being compatible with Android. It also offers additional functionality that is not available to customized implementations like Lenovo’s Android TV. There are signs that Android could spell trouble for Google TV even if Queiroz is right about the CE market. Google’s next big goal after the new devices from LG, Vizio and company hit the shelves this year is to get pay-TV operators to adopt the platform. That’s one of the reasons why Google is purchasing Motorola Mobility, and that’s also why the partnership with Marvell is so important. “We absolutely see the operator and retail set-top box market as a great opportunity for Google TV,” acknowledged Queiroz this week. 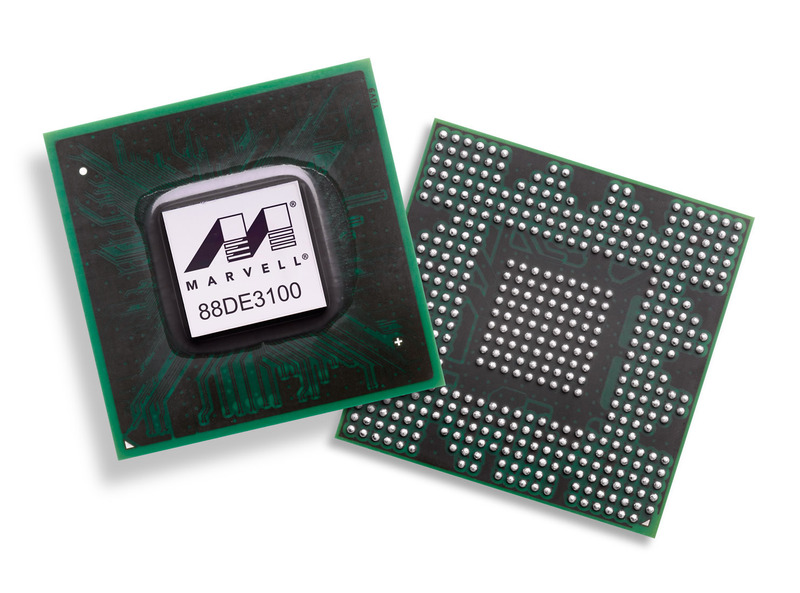 Marvell's ARMADA 1500 processor is powering the latest generation of Google TV devices, but the company is also betting on other flavors of Android-powered set-top boxes. The question is, Will operators sign on? Marvell Senior Product Marketing Manager Edward Silva, whose company supplies Google’s hardware partners with the processor that powers the latest generation of Google TVs, is cautious. “It will be a matter of time before they open up their walled garden,” he told me during an interview last week. Silva said that operators have been looking for an open platform for some time to power their next generation of set-top boxes, and Marvell is expecting that some of these new Android set-tops will come to market in the second half of this year. 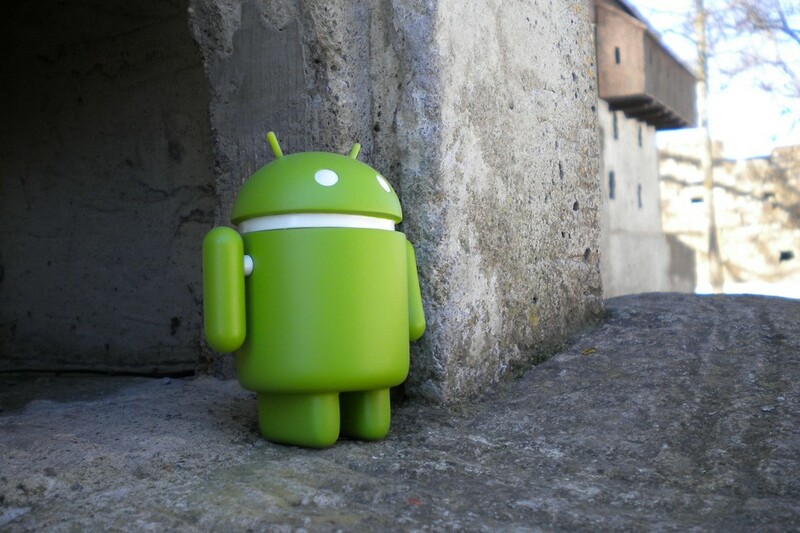 However, it’s doubtful whether cable and satellite will be ready to open their devices up to Google’s Android Market. “The operators are taking baby steps now,” he said. Silva isn’t the only one who is skeptical. “The cable operators are not ready to embrace Google TV and Android as a whole,” I was told by Myriad Group Business Development VP Olivier Bartholot when I quizzed him about the topic. Myriad has been active in the mobile phone space for years, and the company recently started to offer Android-based solutions to pay-TV operators. The company’s pitch goes a little bit like this: We’ll give you all the apps your customers want — but none of the ones you don’t. This means that cable operators can bring Android apps to their customers without investing in expensive new hardware or giving Google access to their platform. Bartholot is convinced that the latter is key. “A lot of customers that we are talking to are very concerned about Google TV,” he told me. On the other hand, Myriad is seeing a lot of interest in its solution, and in fact it is going to trial Alien Vue with a large U.S.-based pay-TV operator in the next few months. A the same time, operators are realizing they have to offer some Google TV functionality to their customers. “It all started with the take-up of over-the-top boxes,” said Bartholot. Google TV, Roku and all of the competitors may not have sold huge numbers, but they have definitely changed how consumers think about TVs and what they expect from the box they are renting from their cable company every month. Silva agreed. Consumers are demanding apps, so operators are moving toward Android, he told me. The question is, Will they go for an open approach like Google TV or for a more controlled environment like Alien Vue? Google’s Queiroz is convinced he can convince the industry to join him. “There are a number of operators that are eager to have the functionality [of Google TV] rather sooner than later,” he told me, adding that Google might strike its first partnerships outside the U.S..
New Google TV is one of the hottest things in the market right now with LG chosen (etechmagdotcom) as a partner to make TV sets that are compatible with newer software for upcoming Google TV. Nothing has been officially stated about LG’s role but assuredly Google wants to capture this market as soon as possible in a perfect way. For me, personally, I am waiting for Apple TV as I am an Apple fan than of Google. “Consumers are demanding apps” – really? I like to watch TV, not diddle around with cell phone apps on it. Apps are the new with channels! This not only gives viewers smarter, easier, access to traditional content. This completely reframes the competition between content providers. Smart interactive-content-behaviors become the new irresistible and unstoppable content market differentiators. What does replacing the-Channel as Content-Platform with the-App as Content-Platform mean for content producers? It means that smart-interactive-content possibilities and viewer relationship capture systems are then limited only by the content producers algorithmic / graphics imagination. Oh â€“ and one more benefit! This helps, both content-producers and content-consumers, kneecap those recidivist, monopoly, middlemen, gatekeeping, slackers in the cable and satellite industry that are so fond of running interference on our emerging integrated-media eco-system. Your writing style is very reminiscent of Buckminster Fuller. You seem to be certain that Apps will replace channels. While I do not disagree with the consequences of this, I wouldn’t settle for a treadmill as a replacement of a beer mug. Yes, apps imply lean-forward behavior, active participation…essentially, having to exercise my gray cells. Channels allow me to switch off my brain (drinking beer doesn’t require brain power, does it?). Jokes aside, the lifestyle change that apps bring (in place of channels) needs consumer acceptance. I wouldn’t hedge bets that this is an easy thing to happen. Why do people see AOSP as a competitor to an official Google bless build? Google makes money either way. You cant really call it competition, when the competitions product still adds to the competitor coffers. Bill, Android-powered TVs by companies like Lenovo won’t have Google apps, so a big part of that ad revenue won’t materialize. Of course, you can follow Google’s logic and say that the company profits whenever people use the web. And if people use the web on their TVs, Google may actually have a chance to display more ads on its own and other web properties. The problem with that logic is that something like the Alien Vue approach of a curated and controlled Android in the cloud may not even come with a full-fledged web browser, or at least put a much bigger emphasis on apps vs. the web. Of course, there’s a third argument to be made: Google wins if Android is more attractive to developers. By that logic, Amazon’s Kindle Fire is also a blessing in disguise. I’m not sure what the net positive of this would be, but yeah, there might be a silver lining even in fragmentation. Android is surely a big competitor for Google TV and guess what, Google insiders might readily acknowledge. GTV is a kinda NBD marketing venture within Google. Android, on the other hand is seen as a bread-winner. Anyway, when was the last time Google made a success (or money) from something original — other than search? Google TV is not destined for easy success. Google TV could become a success when inspired by (yeah, hate me for this) Apple TV. But Apple TV is swinging between being a hobby and Fermat’s last theorem. When Cook and co finally crack it, GTV will rejoice. Till then, LeTV and several similar clones (many of which are not on public display at CES) will make hay. And why not? When was the last time Apple made anything original since the graphical user interface though?